How does the buyers’ journey look, seen through the eyes of buyers? On big-ticket, carefully considered B2B purchases, the buyer’s journey is often strewn with obstacles. 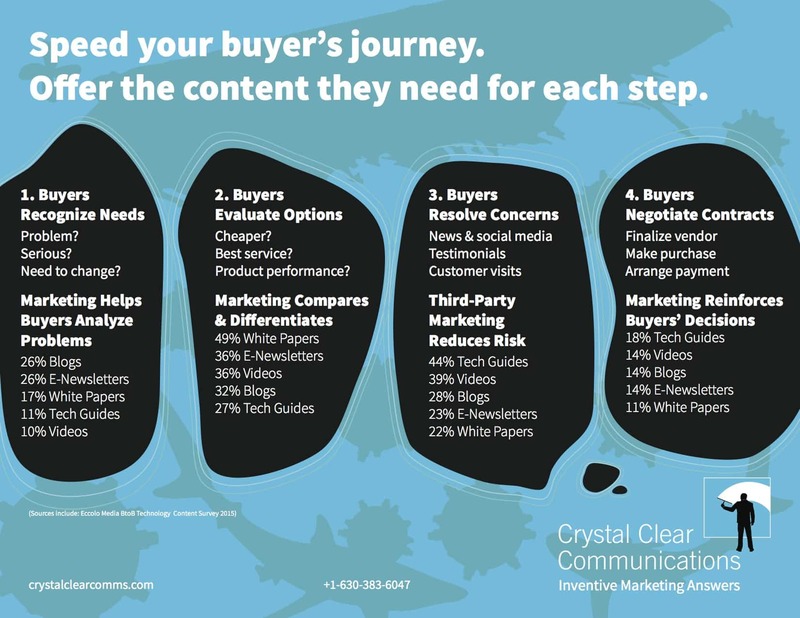 To cultivate sales, content marketing must make the buyers’ path crystal-clear. Understand buyers’ needs, their worries, and their questions. Give them the exact information they need to move the journey forward. To be clear, not all buyers take the same steps in the same sequence. In case of an emergency such as an accident or plant shutdown, buyers may skip a step, rush through quickly, or follow a surprising path. For carefully considered purchases, buyers need to address specific questions at each step in the buying journey. Buyers prefer certain media along the way, as the 2015 Eccolo Media BtoB Technology Content Survey shows. 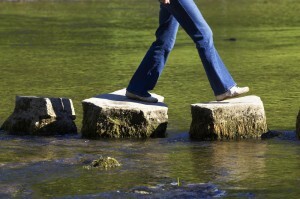 Imagine that taking a buying journey is like your buyer crossing a river on stepping-stones. 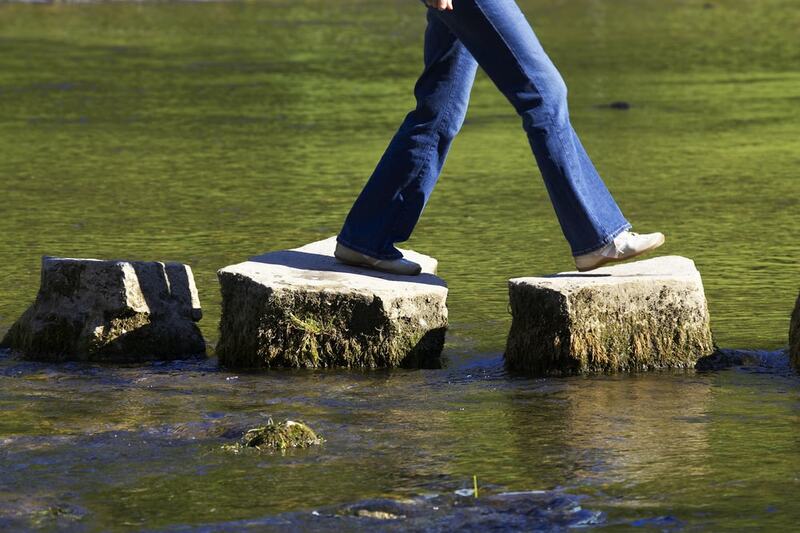 Buyers need to follow a clear path, all the way across the river, to make a purchase. If critical information that buyers need is missing, that’s a missing stepping stone. It forces buyers to turn back. When they go back to Google, you’ve lost a chance to make a sale. By making sure there’s always a clear next step for customers to take, you’ll win more customers. As buyers take the first step, it’s a huge leap of faith. When they succeed in making the journey with you, they reach the other side, buy and become your customers. The stakes are high. If buyers fail, it costs you a sale. But on carefully considered purchases, a mistake can cost your buyers much more – time, money, their reputation, and perhaps even their career. 1. 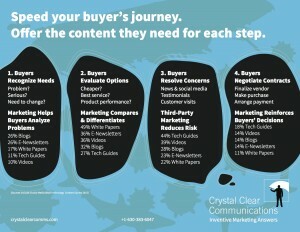 Blogs and e-newsletters can launch the buyers’ journey, as buyers recognize their needs. In this first step, buyers figure out whether they have a problem, how serious it is, and whether they need to change the status quo. Marketers can win by helping buyers diagnose the problem. During pre-sales, buyers prefer blogs and e-newsletters (used by 26%) to white papers (17%), detailed technology guides (11%) and videos (10%). Well-done blogs can generate thousands of followers, and may represent 1/4 or more of overall website traffic. They’re a great step to start the buyers’ journey. 2. As buyers evaluate options, they make a long list of sellers can help them address a problem. Buyers ask questions such as: Which solution performs better? Who provides better service? Which has a lower price? What are the trade-offs? Marketers can win by helping buyers compare options – both within your product line and with competitors’ lines – and by differentiating among the options. As buyers evaluate options, they start to seek long-form content such as white papers (49%). In this step, buyers also consult e-newsletters (36%), videos (36%), blogs (32%), and detailed technology guides (27%). When customers click a link to a white paper, they expect to find thought leadership, meaty substance to help them address a specific problem. For example, buyers are looking for an objective comparison of alternative approaches. They will reject thinly veiled advertising that pretends to be a white paper. 3. As buyers move forward, they narrow to a short list of sellers, then resolve concerns. At this stage, buyers seek all the verification they can find, up to and including face-to-face visits with your reference customers. Marketers can bolster credibility with case histories and third-party testimonials from peers, as well as trade media and industry analyst coverage. At this step, buyers gravitate to detailed technology guides (44%), videos (39%), blogs (28%), e-newsletters (23%) and white papers (22%). 4. Finally, as buyers approach signing a contract, they seek less content. Yet they continue to look at detailed technology guides (18%), videos, blogs and e-newsletters (tied at 14%) and white papers (11%) to reinforce their decision. Make the next step clear for customers with the right content marketing. Once a sale closes, buyers continue to expect content that helps them become successful users. Content marketing after the sale can strengthen customer relationships and provide you new opportunities to cross-sell and upsell. For more ways to speed the buyers journey, subscribe to our blog.